I am a big fan of meals that have more than one course. It lends a sense of occasion to weeknight dinners and makes the host/cook of dinner parties seem very impressive (especially if they sigh happily after taking the first bite – it’s a fabulous ego boost). The problem I encounter when preparing two course meals is I tend to get quite full about halfway through the second course and finishing becomes less about pleasure and more about struggling through. I suppose I could just leave the plate partially unfinished but having been brought up to finish your dinner I find this a little difficult to get my head around. So! I have concocted a two course meal that one can prepare quickly on a week night. I find at around Thursday I start to flag a little in terms of energy and while my body craves heavy carbs, they often leave me feeling bloated and exhausted. If I pump my body full of lean meat and vegetables I find I am able to wake up on Friday and muster up the energy to get through the day. Both courses have the benefit of being very good for you and not being overly filling. The second course is a stir-fry and if you pile extra veggies on your plate instead of rice you will be able to fit more in without feeling like you will explode. Heat the peanut oil in a large non-stick pan. Add the garlic and cook for one minute until fragrant then add the chicken thighs. Cook for six minutes on each side. Once the chicken is cooked, place on a chopping board and roughly chop into little pieces, then scrape and add the loose bits of garlic over the top. Fill a medium sized bowl with warm water and dip a rice paper sheet into until it becomes slightly floppy. Then place on a flat board. In the middle of the sheet sprinkle a line of the chicken horizontally across the rice paper sheet, making sure not to reach the edges. Then add a couple of pieces each of the vegetables and a sprinkling of the fresh herbs. Finally, roll the rice paper roll up like a mini burrito. If your technique is not perfect (mine is far from) feel free to roll it up a second time. (This is why I included a dozen rice paper sheets in the ingredients). Second Course: Beef and Asparagus Stir Fry. Heat 1 tsp of the peanut oil in a large sturdy based pan. Stir fry the beef for three to five minutes then set aside. Add the remaining oil to the pan along with the garlic and stir fry for one minute. Then add the asparagus and broccolini and stir fry for two minutes. Then, add the beef back to the pan along with the baby bokchoy. Stir fry for two minutes until the baby bokchoy has just wilted. Finally, add the sauces and chilli to the pan and mix thoroughly. Enjoy! 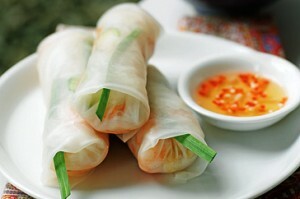 The chicken and rice paper rolls look delicious! They kinda look like sushi and I LOVE sushi!